Outfits that straddle summer and autumn need to include a part that’s fall-like, something that’s lingering from summer, and accessories that are possibly suitable to both summer and autumn. 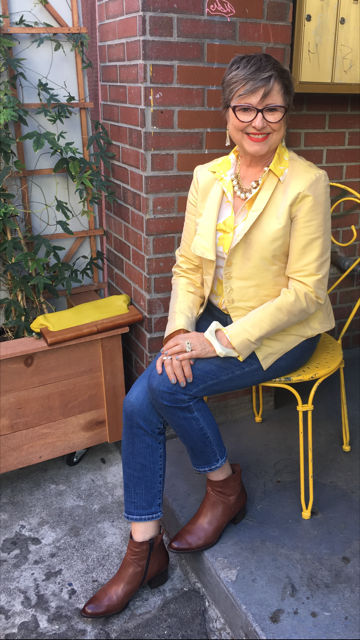 I needed to wear one of these outfits on Saturday morning when I was going to meet my friend, Debra, at Uber Optics in Petaluma to pick up her new glasses that we choose together two weeks earlier. 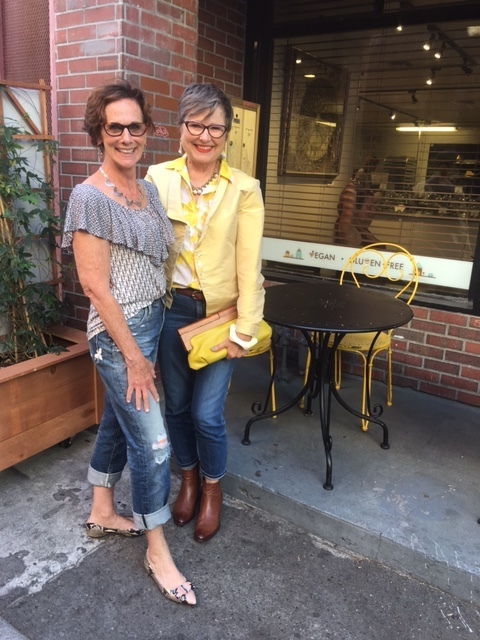 This wasn’t like the previous Saturday when Russ and I were heading into Petaluma and I had a good thirty minutes to concoct my triple denim outfit. No, this Saturday I had spent way too much time cruising Instagram, lazily getting through my Morning Pages writing, and starting a cool writing exercise Debra had shared with me. When I looked at my bee watch, I only had ten minutes to get dressed. Yikes! With my SOS recipe in mind, I reached for my just laundered seasonally-neutral Alina ankle NYDJ jeans. 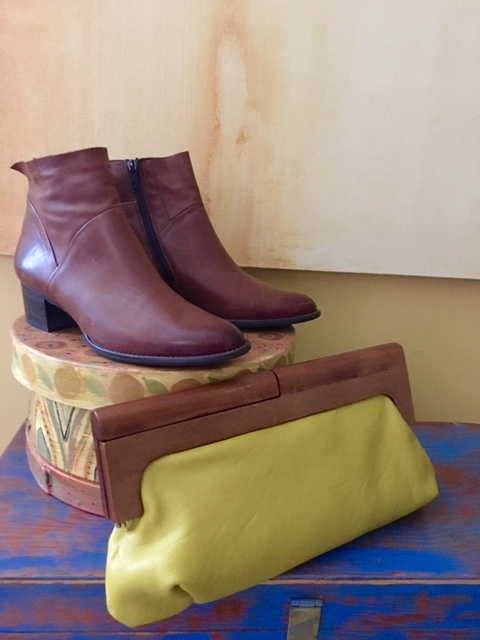 Next I decided on my undeniably Autumn pieces which were my newly purchased Paul Green Nelly Boot and my bison leather belt that is the same color as the boots. 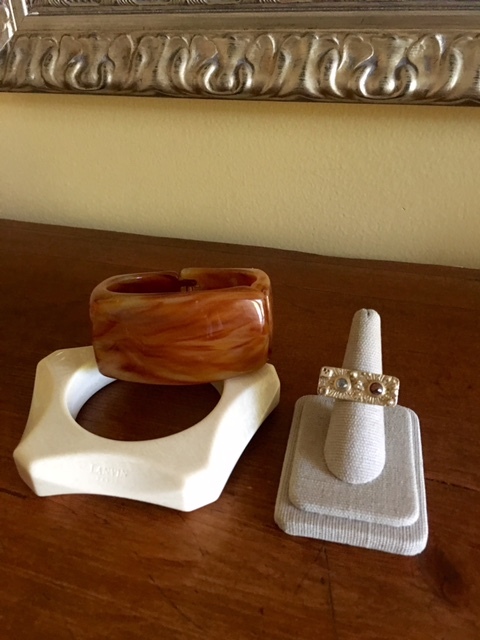 I added a hinged cuff bangle in the same brown color. The total bonus was when I decided to grab my Marni clutch and the wood frame was a similar shade of brown. The accessories I decided to wear are pretty seasonally-neutral. 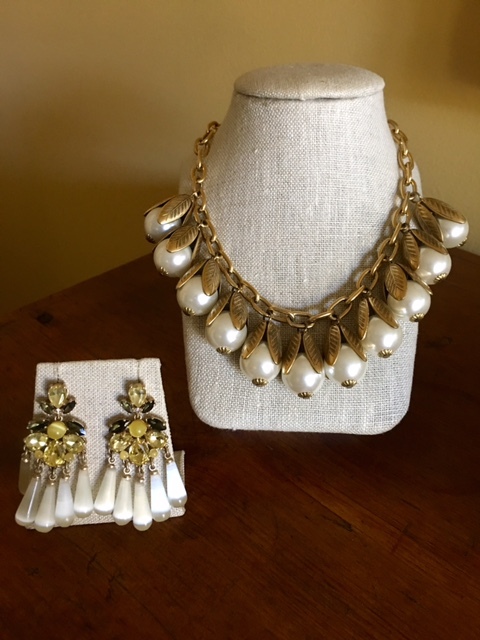 I liked filling in the neck of my blouse with these fun chunky vintage looking pearls. I added the playful earrings that I got this summer from Banana Republic. I like how the white cones echo the white in the pearls. And those mustardy colors in the earrings blended in with the handbag. I wanted bangles so I reached for my vintage Lanvin creamy bangle and the hinged cuff I mentioned that echoes the color of the boots. Naturally, the owl ring fit right in with the mix. I thought about adding a jean jacket and doing the double denim thing but gosh, everything seemed to be moving in a prettier direction. I looked at my jacket section and saw the yellow Lilith jacket that I haven’t worn much this summer. I was running out of time to even look at it in the mirror so I was going to go with it if it felt right. I slipped into it; it felt just right. (Goldilocks, give me a high-five!) So there was the one-third summery part of my outfit. After we had lunch I took Debra to a new bakery in town called Bump City Bakery. She used to own a bakery so it’s always fun to watch her as she scopes out the goods and talks to the bakers. We each got a gluten-free cookie (totally yum). The bakery is in an alley between Kentucky Street and Petaluma Avenue. That’s when we came across this amazing mural by Dom Chi, 2015. 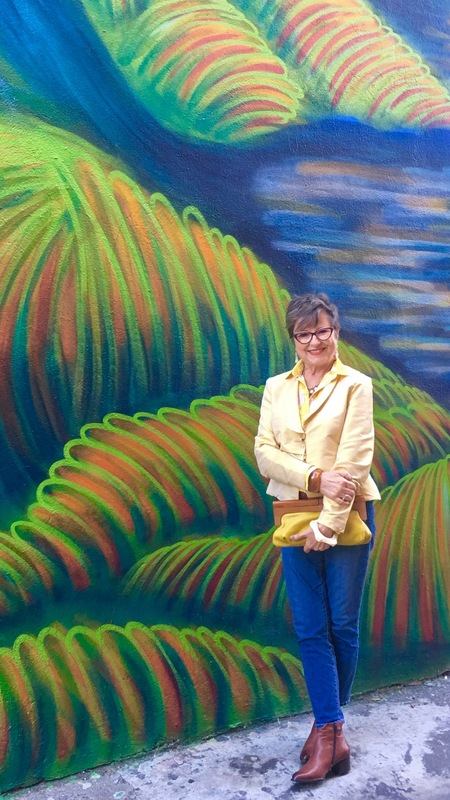 Debra said, “Your outfit would be perfect in front of that mural.” She claims she can’t take pictures but she did a great job! I just have to show you another one. Isn’t it so cool? So, besides learning the recipe for September Outfit Straddle (it kind of sounds like strudel, doesn’t it? ), I’m going to leave you with a list of Petaluma places to check out if you’re in the area. Uber Optics for great eyewear. Water Street Bistro for great food. Della Fattoria for great food, bakery goods and coffees. Bump City Bakery for all your gluten-free bakery needs. Obsessed Beauty & Style for clothes, shoes, accessories and a brow bar. And sorry this part is getting to you late, but the Petaluma Antique Faire happens the last Sunday in September and the last Sunday in April. Russ and I love going there. Last year I bought my beautiful Danish mid-century teak desk from one of the vendors. I’m writing from it right now. So that’s where we were this last Sunday. We decided to go to Della Fattoria for a coffee and to read the paper when guess who popped in for the same thing? Our friends Debra and John! There’s no getting away from a good thing. And if you’re reading this, a very special hi to Wendy from San Francisco and her sister Anne from Vallejo who introduced themselves to me while strolling through the Antique Faire. Wendy recognized me from Instagram. They were raised in Petaluma and we had a fun time chatting. Really, it’s a friendly town. Check it out! So my friends, have you come up with some great SOS outfits? Care to share some of the ingredients? I have some linen blouses in autumn colours, dark green, khaki and brown, which I like to wear this time of year. I’ll put them away soon as it will be too cold for linen, but the colours say autumn. However it’s only 62 degrees here, so I have brought out the winter jumpers too. You’ve totally inspired me! 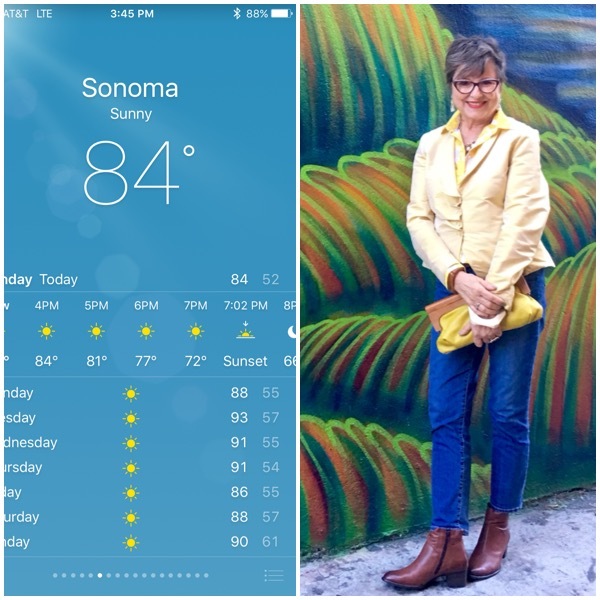 I’m wearing a black linen dress right now as it’s going to be 93 degrees in Sonoma. I’m putting an overblouse on as a lightweight jacket, anticipating air conditioning at lunchtime. I also think that’s a great idea for everyone to have a few of those at the ready. Note to self next spring: purchase linen shirts in dark colors! Trinnie, nice to meet your son Dominic! Glad you enjoyed the ideas. Always a pleasure to hear from you from Oz! Love your posts as always – still hot down here in southern CA! Hi Brenda! I actually got them at TJ Maxx! My daughter Erin spotted them and at the time I remember them looking more vintage than I was comfortable with but alas, they are perfect for me! Great blog!! And beautiful pictures!! 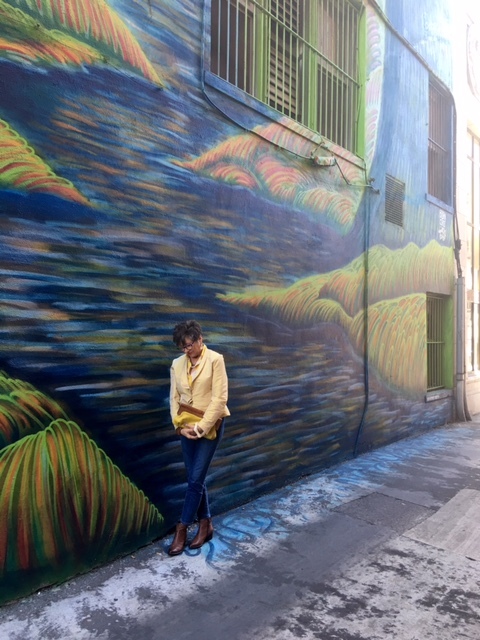 To see that a background like a mural and the colors from a bakery can enhance who we are and what we are wearing is a new phenomina to me. I think next time I go somewhere special, like a restaurant etc., I am going to look it up first so that I can discreetly look my best and fit in with the surroundings without anyone knowing that I did so!! Well, Missy, thanks for YOUR great idea. I LOVE THAT. And thanks for taking nearly all of the pictures. I hope when you go somewhere special that I’ll be going with you! That was such a fun day!!! Great outfit BK, I think we have all been a little stumped, as to what to wear right now. Love the formula that you created for the transition! Really, right? I sweltering today! What a great SOS you created! Fabulous! Thanks for sharing the details. I can totally see it! Love the SOS! Clever and so appropriate! It’s hot, hot, humid here on Lake Erie! 92 today..uck! Layers are essential. It’s cooler in the morning but you can peel off a blazer by noon. Love your photos and favorite sites to visit! Wonderful tips as always! Have a great rest of the week! Thanks so much, Kathy!! Just looked at our temperature in Sonoma, 95 degrees, and I’m feeling every bit of that! I love your blog and style. Thank you for all of the interesting details you provide about your thought process in styling your outfits. 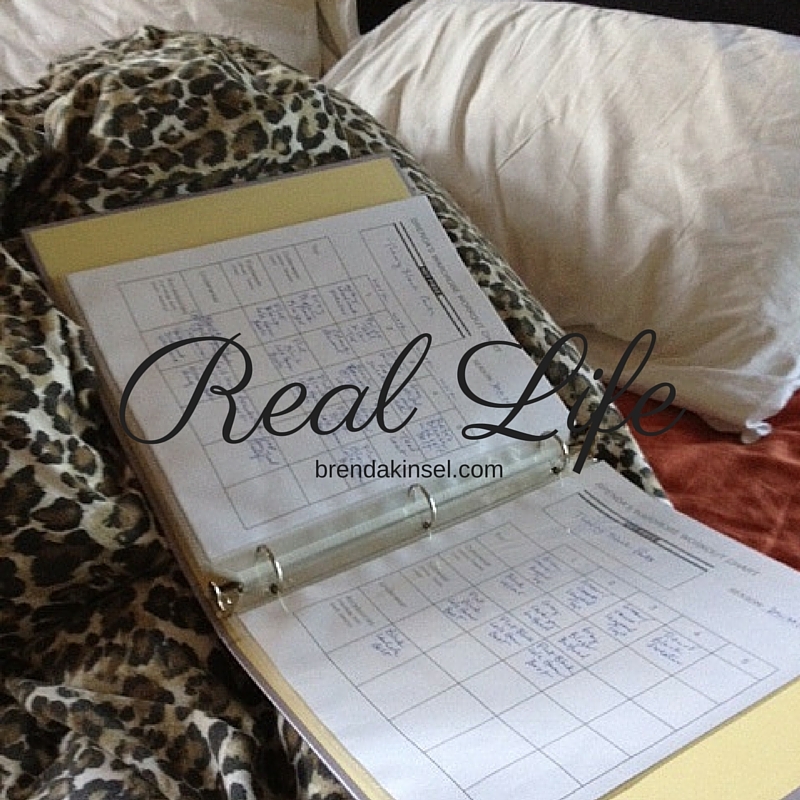 It’s so fun to read through your writings and to see all of your photos too. I love love love clothes and style but none of my friends do, so I really enjoyed finding your blog recently as it has made me feel like I have a friend who loves clothes and style as much as I do! Oh you have lots of friends over here at this blog who share your love of clothes and style. I am overjoyed that you found this like-minded spot! Welcome, Justine! Love your outfit and I’m in a bit cute f a style dilemma make self. I have a business casual meeting tomorrow and you can wear jeans. Like you the weather is still summer and not fall yet. I’m wearing a black sleeveless turtulneck dress with a camo jacket and black booties. I hope I’m not to warm, but I will be inside so there will be air conditioning. Your color palette is perfect. Oh and one more thing I need details about your writing exercises? Thanks! I hope your meeting goes well! This writing exercise shared by my friend is for seeing other possibilities in a situation. I’ve only just begun to work with it. If that sounds interesting to you, send me an email and I’ll email the directions. I’m not familiar with it enough to share it on the spot and it’s quite involved. I hope to have more time to fiddle with it this weekend. I like THE LOOK of DEBRA…………she looks vaguely familiar to me!YES, she was right about THE MURAL and her SHOTS ARE GORGEOUS! 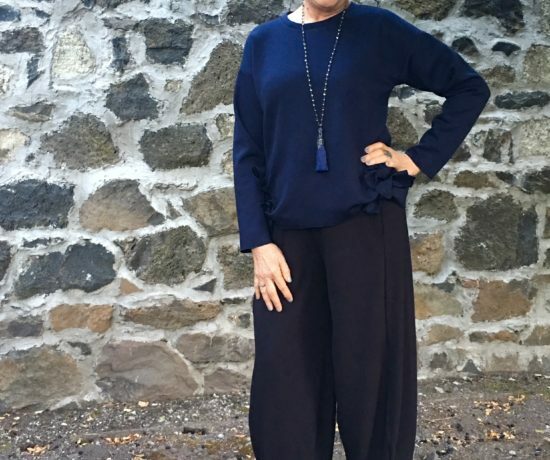 SOS outfit for me………CAFTAN and LEGGINGS………..and OFF I JETE INTO THE FIAT 500 and DASH away!Normally to the GROCERY STORE! That’s such a fun story! And thanks for your SOS details, my dear!